the shadow and work to destroy the evidence or people who expose their evil. The more humankind advances in knowledge, the more we realize how little we know. This has always been the case for those who seek knowledge; that is, the more you know, the more you realize there is to know. Reality is like the Russian Matryoshka nesting dolls and presently, humankind is the smallest doll in the center. Just as the butterfly fights for freedom, we are “cocooned” in a reality from which we must and will struggle to be free. In order to be free, we humans must recognize we don’t know what we don’t know and that it is in our best interest to keep our minds open. God created this universe with its laws, principles, and cycles of life which have operated since the beginning of time and yet operate flawlessly regardless of what we humans may believe. Although many who have never attempted to explore the inner universe might doubt its existence, I assure you from personal experience and from evidence gleaned in psychology, philosophy, and many spiritual disciplines, there is little doubt that the inner reality has an immense influence on the external life of the individual. Unfortunately, the darkness, sensuality, and evil of this world have a far greater influence which can diminish the spiritual nature and wither the soul of those who ignore the Light. Those who have not explored the depths of being within are not qualified to disparage those who have nor are they qualified to discount the spiritual knowledge which is available within that can shed light on the nature of evil. This website is an effort to present another level of Christian reality, one that embraces a wider range of spiritual principles and opens the doors to the truth within allowing for those who seek higher knowledge to emerge from their current “cocoon of reality” and experience the Christ light within. The “religious cocoon” we have known for generations has served humanity well, it is a comfortable and secure form of worship, but what if circumstances in the world such as war, terrorism, or the collapse of the economy and society forced people from their pews – with their faith severely tested, would their beliefs be shaken and would they be able to truly feel the presence of Christ in frightening, life-threatening circumstances? Since the beginning of Christianity, there has been an “on again, off again” relationship between the “church” and the “mystic.” There was a period of time in which the clergy of the church would seek out the “mystic hermits” for their insights and visions regarding Christ, and they would preach these revelations in their churches. In the seventeenth century, the church persecuted the Rosicrucians and the alchemists of Europe who taught mystical Christianity. The word “dichotomy” expresses the relationship between things that are opposite or different yet the same. This definition applies perfectly to institutionalized Christian religions which are founded upon objective beliefs and Christian mysticism which is based on subjective reality. Institutionalized religions have fixed beliefs and many of these teach that the Holy Bible (or Catholic catechism) is the only source from which to learn about Jesus Christ. Yet, early Christian disciples recognized that direct knowledge of God, Jesus Christ, spiritual truth or ultimate reality could be obtained through meditation and intuitive insight. In fact, spiritual knowledge may be found wherever the light of truth is revealed. Having studied spiritual teachings for over 50 years from a variety of religions and philosophies, I have discovered that there are many common denominators between eastern and western perspectives. For example, Hindu and Buddhist mystics recognize, acknowledge, and write that the highest spiritual light they experience in their meditations is the Christ light. Anyone from a religious or spiritual practice which recognizes the subjective reality and goes to the center of his or her being will discover the Christ light. Since the beginning of Creation, there has only been one true Light, the Christ Light. Jesus has not been the only one among humanity who has been infused with the light of Christ. As the mystic Meister Eckhart said, “It is of more worth to God that Christ should be born in the virgin soul than that Jesus should have been born in Bethlehem.” Another common denominator that Christianity shares with the religions of the East is the term karma. Christians know this term as, “As you sow, so shall you reap.” Scientifically, this is known as the universal law of cause and effect. Unfortunately, most Christians do not understand karma because they do not understand that the soul lives many, many different lives. Most Christians believe that this one life is the one and only, therefore, to them the verse “as you sow…” means that at the end of your present life, reaping will determine whether you go to heaven or hell for eternity. Active salvation means to take full responsibility for your life, recognizing that all of the unique circumstances you experience are of your making. Resolving the particular issues of our lives and not creating new ones is the challenge of active salvation, that is, finishing this life with a relatively “clean slate” and not carrying excess baggage into the next life. The soul and spirit of each person lives many lives in different bodies; in each life the soul is imprinted through innumerable experiences in varied environments, conditions, and situations which explains why everyone in the world is so unique and why some people are: healthy or sickly, advantaged or disadvantaged, needless or impoverished, smart or dull, or living in peace or in fear. The karma imprinted on each soul determines where it is born and lives, what family it is born into, what opportunities it will have, and what it will do with what it is given. What we sow in this life, that is, what we think, speak, and do in life is our “new and unresolved” karma. These thoughts, words, and actions are imprinted upon the soul and are carried over with our spirit when the body dies. What is imprinted upon the soul when we die will determine the circumstances and conditions of our next life. After we leave the physical plane, we will awaken and all the deeds of the previous life will be present in the pure, divine Light to be examined and judged. What happens is our soul is bathed in the pure Light of Christ, and all imperfections, every “dot and tittle” are blatantly revealed for each of us to see. In the Light, we are unable to deny the Truth and we judge ourselves. This is what happens for souls who are of the light; but not all souls are of the light. To provide a comprehensive explanation regarding the cyclical and universal experience pertaining to all souls requires taking a step back. The paper Being and Soul identifies our physical, emotional, and mental life experiences as our being and how our being and soul are passive and active aspects of each other. Our individual soul is imprinted with every thought, word, and deed of this life and is the permanent record of life. As a human being, we carry our life experience with us wherever we go which is why we can feel and perceive the beingness of the people we meet and they can feel ours. This beingness (biologically, psychically, and mentally) is detected and experienced subjectively; it is revealed in the countenance of a person, in their physical form and body language, in the coarseness or refinement of their speech and manner, in a sense of trust or suspicion, and whether they are carefree or have an agenda. Most importantly, beingness dictates whether a person’s aura or atmosphere is filled with light or darkness because it emanates the qualities which are associated with these traits. Think of a soul as a prism hanging in a sunlit window. As the white light of the sun shines through it, the prism shines forth in a rainbow of colors. The clarity of those colors is defined first and foremost by the cleanness of the glass, the smoothness and symmetry of its facets, and whether the prism is broken, cracked, chipped or whole. There are souls in the world in which very little light shines through. Another way of describing the quality of being is to clarify whether a soul is filled with “lightness of being” or “heaviness.” Actions which are good and right are light, and actions which are against the laws and principles of nature and Creation make a soul heavy, dark, distorted, and in many cases, evil. This is the first important characteristic of the soul to be aware of because when people of the light die, their souls rise out of the body through the top of their heads and begin to move through the higher planes. Their next life will reflect every aspect of the goodness, beauty, and creativity they did in their previous existence as well as provide opportunities to correct their mistakes and learn the things they missed. When the people whose souls are dark, evil, and “heavy” die, their souls leave through the lower openings in the body and sink into the crust of the earth to reside in the dark, evil, and lower psychic energies they had a hand in creating. From their personal perspective, this field of dark psychic energy is cold and lonely filled with horrible, frightening demons which constantly torment them as they endlessly review the evil actions of their life from their victims’ perspective. Without a physical body to act as a buffer, the individual will suffer horribly from this review and from the demons (they created) painfully and persistently tormenting them. They will reside in this situation, in isolation, until these dark, sinful energies are neutralized enough, at which time they are forced into another life experience; they will live lives of misery, torment, and depravity for the purpose of atoning for past sins. Corrupt and loveless souls do not live as many lives as good people because of the additional time spent neutralizing their errors and as a result, these beings are not as evolved; this is just one example which accounts for the unique circumstances and differences in the lives of human beings. These corrupt souls will be given abundant opportunities to make amends for their past errors, if they will but choose to do so. The reason there seem to be so many evil, bad, distorted, corrupted, loveless, confused, and lost souls in the world today is that we are in a time in which the children of light and the children of darkness live side by side. This is also a time in which spiritual light is greatly increasing in the world which makes the “shadows darker” and more evident; spiritual light is accelerating world events, and it is intensifying personal experiences, but it is also forcing good people to awaken to the light. People have been confused as to why there is such corruption, darkness, and evil overtly and shamelessly manifesting in our country – up is down and down is up, good is bad and bad is good, right is wrong and wrong is right; and perversion of truth, murder (abortion), lying, cheating, deception, and lawlessness are all acceptable, even in our politicians and government. This kind of double-speak and ignore-ance of this darkness by many leaders in government, in our political systems, in our country, in our businesses, in our schools, in our media, and elsewhere are baffling; it makes ordinary citizens think that perhaps many of our leaders are a part of as well as promoters of the darkness. People are genuinely confused as to why this evil is being foisted upon us. They are finding it very difficult to put into words what exactly is happening to the fabric of our American society as the values we have cherished as Americans and as Christians are being denigrated, diminished, ignored, and subverted. We desperately need to understand and to articulate what is happening so we can take a stand against this darkness and insanity. What is happening in our world today can be explained in terms of the energetic, creative abilities with which our Creator has endowed each of us. There is no need to use moral judgment to explain the manifestation of darkness in some souls; it is just a matter of stating the creative facts. There are a few basic premises to establish first: God created this “framework” called life and it continues to work flawlessly as He created it regardless of what any of us believe; we humans, by our thoughts, words, and deeds fill in the framework which configures our individual life; the workings of Creation can be known if a person seriously seeks such knowledge; we are each the creators of our own life; all of the individuals in this time-space reality are exactly where they are supposed to be in life and they are exactly who they are as a result of their thinking, decisions, and actions; there is absolutely nothing and no one to blame for who we are, where we live, or the circumstances of our lives other than ourselves. Each of us literally has created the conditions of our lives. It was explained in the aforementioned paper that being/soul are two sides of the same coin. Everything we do in our physical, emotional, or mental being is imprinted upon the soul. 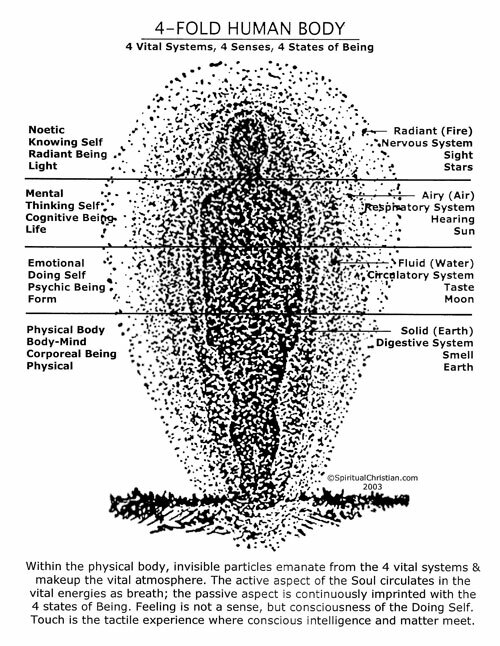 People are continuously imprinting their being/souls with light, darkness, or meaningless nonsense. Generally speaking, people of the light believe in God; they try to live a good life, they strive to know the difference between right and wrong, they value life, they try to treat others kindly, and they attempt to be good persons. People who live in this manner today have done so through many previous lives, or they would not have the opportunity or inclination toward God, goodness, and light. Destiny, or karma, enters the world with a newborn; environmental and parental conditions of a newborn are part of its destiny. Between lives, the souls who are of the Light prepare for themselves the necessary life experiences so they can: learn to be responsible for their life; make the right decisions in life; discover who they are; and learn about our divine-human nature. This life is our school and it requires a great deal of knowledge and life experiences before we are able to emulate the divinity and selflessness of Jesus Christ. There are many shades of darkness just as there are varying degrees of light. People of the darkness are the way they are because they have lived and are willing to live (unrepentant) in such an evil manner for many lives. The darkest and most evil people are those who intentionally hurt others. These beings are the tares or goats of which the bible speaks (one day they will be separated from humanity). Evil people are not concerned about God; they know the difference between right and wrong but do not care; and they refuse to acknowledge the evil of their shadow self and attack those who expose their dark and selfish deeds. They are heartless people who do not value life; in many cases, not even their own. They are not concerned about others but use them for their own purposes and gratification. They do not care about anything but their own self-interested agenda. Among the souls who are really evil such as murders, rapists, serial killers, child abusers, the loveless, and those who hurt others are the lost souls. Lost souls are beings in the world today who are so evil that God has withdrawn from them the spiritual light with which all humans are endowed. 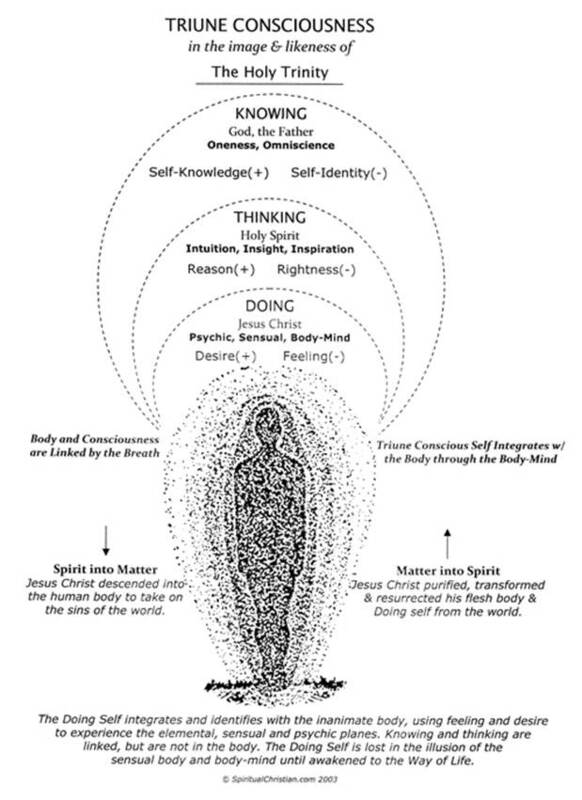 This means the triune Self disconnects from the 4-fold physical body (see top diagram below), leaving nothing but the human animal shell with all its lust, anger, violence, hunger, and evil desires. A lost soul is totally devoid of any conscience or sympathy for others and in some cases, they are even devoid of rational thinking. In psychological terms, this so called human is referred to as a psychopath, a sociopath, or psychotic and in some cases, they are like any other vicious, instinctual predator. The psychopath and sociopath are of two types – the intellectual or the animalistic – the intellectual is smart, devious and vengeful, whereas, the animalistic is mean, violent and vicious. The intellectual types toy, torment, harass, vandalize, stalk, and sometimes, kill their victim as a way to satisfy their obsessive vengefulness or lust; these people often have low self-esteem and their victims are somehow linked to their “wounded self-image.” The animalistic types are just mean, heartless, and violent acting out from anger or lust, like a vicious animal. The unrepentant nature of these lost souls means that at some point, according to God’s will, their soul will cease to exist. Generally speaking, those in a somewhat “lesser” category than the lost souls are the way they are because they have lived a “pattern of being” over a number of lifetimes and carried this pattern over into this present life, such as those who are sexually perverse. At the top of the heap in this “lesser” category, are those people who intentionally hurt others psychologically and/or emotionally. This category includes people who unrepentantly ruin other people’s lives in some way such as those who: abuse power or fail in their duties to the people they serve; misguide or abuse young people or children about their sexuality; purposefully confuse others about their gender; misguide others about values; teach kids to disrespect or ignore their parents; or encourage kids to steal, to hate, or to hurt others. There are also those who hurt themselves, such as: atheists, blasphemers, sorcerers, adulterers, thieves, the sexually perverse, the gluttonous, the lazy, the greedy, and those filled with anger, pride, arrogance, lust, or envy. The soul of each person is imprinted with the details of their sins – every “dot and tittle” is known and they will be judged in the Light of God when they die regardless of what they believe. God is a loving and caring God, not a vengeful God. The laws of Creation will give these souls the opportunity to understand the harm they have caused to others so they can repent. After death, depending on the nature of their offences, these souls are placed in isolation or in the horrible circumstances they forced on others so they experience ALL the pain, suffering, and harm they caused their victims; this is all they will experience in this state until they recognize the errors of their ways and repent. Following genuine repentance, these souls will enter a new life, carrying with them the sins that must be reconciled. The state of “hell” is for the purpose of making a soul recognize the effect their actions had on others; it does not eliminate the karma which has been generated. Neutralizing karma is accomplished only through right living with a truly penitent heart, often repeating a life with similar circumstances. Successfully neutralizing karma in a given life brings the soul out of the “negative” and back to “the zero-line” where a new life in the “positive” can begin. Time in hell does not burn away sins; consequently, it is a major regression for the evolution of a soul. Hell is for the purpose of recreating the horrible circumstances one has caused in life so the individual fully experiences the harm he or she has caused to others. Now for the truly sad, confusing, and lukewarm category: there are those people who obsessively, excessively, and exclusively focus their lives upon the meaningless, nonsensical, and superficial dribble of this physical world, such as: desiring money and material possessions beyond their needs; obsessing about the “glamour” of the body and the over-inflated ego/personality; the desire for fame, recognition, and worldly validation. All the while, such individuals remain ignorant of their own souls, spirits, and true divine identity. The result of too much focus on external things of the world results in beings who are lost in: the virtual world, music, games, self-entertainment, the love of the “glamour” of their persona, fame, recognition, drugs, alcohol, sexual excess, and gender confusion. The reason this is sad is because these people have potential which is being wasted. They do not realize that the only thing of meaning any human being can ever take from this world is the goodness within his or her own being and soul. It is simply the nature of this life – we cannot take from it any material possession and we cannot take our bodies. We can only take the essence of our being. The reality is that any adult who is investing his or her life in some “worldly” agenda is wasting time living a pointless existence and meaningless life; this is the source of their misery! This paper has been written to help open-minded people see the larger picture regarding our journey through life. This lifetime of ours and its experience is just one of many. We have much to learn on our journey through this universe. The most important thing to take from this paper is that God, our Father, Jesus Christ, and the Holy Spirit is a loving and forgiving divine Trinity. Anyone who falls into the category of the lesser sins or the lukewarm still has the opportunity to repent and be forgiven. Many sins and errors can be purged from one’s being and soul while still in the body, but not after death. After death, sin-filled souls experience a “state of hell” that is composed of the conditions and energy of their dark, cold, and loveless lives; the devils, demons, and terror they experience are of their own making. From my own research of reliable sources, I do believe there are hellish states similar to those described in Dante’s Divine Comedy which exist in the porous crust of the earth. I do not believe there is a “literal” hell as described by many Christian religions in which a devil resides over a vast underground cavern of burning souls; this image seems to be more of a mythological representation of the states just described above. Regardless of the details, all sins and errors have to be reconciled after each life before a soul can join humanity in its journey toward eternal salvation in the Light of Christ. Hiding murderous lies behind a smile. And with a single word destroy the child. Protect your likeness from going wrong. Then, strike me with lightning and set me free. Lord, banish the shadow from my soul. Everywhere I turn, I see the angels of the light. Lifted by the roots of truth into a holy place.